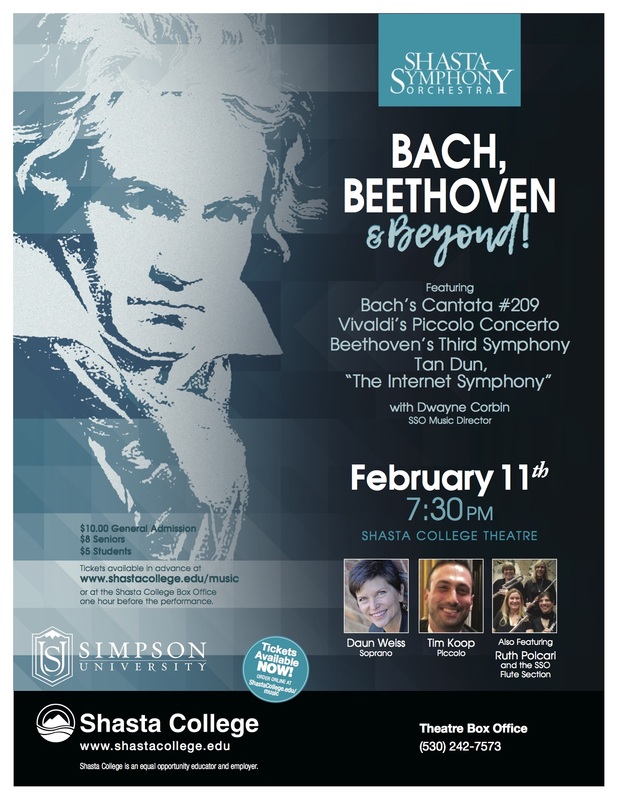 The winter concert of the Shasta Symphony Orchestra will take listeners on a journey from the early 1700s to 2009! A small consort of SSO players will accompany Chico soprano Daun Weiss as she sings the brilliant Cantata #51 by J.S. Bach. Sacramento flutist Tim Koop will then take the stage and present the raucous and joyful Vivaldi Piccolo Concerto in C. On the second half of the concert the full SSO will perform the first movement of Beethoven’s Symphony no. 3 “The Eroica”, followed by an amazing 2009 work inspired by Beethoven’s piece: the “Internet Symphony” by Chinese composer Tan Dun. This colorful and energetic piece was the first “YouTube Symphony” that Google and the London Symphony sponsored to bring musicians together from all across the globe. Finally, the flute section of the SSO, “The Amici Quartet”, will perform two works! Tickets are $5/student with ID; $8/senior; $10/general. Recent concerts: “The Planets” November 1, 2015 Concert!